Olympians are often used as models for performance. Research shows that faster swimmers have more effective technique than slower swimmers, but even the world’s fastest swimmers have technique limitations. 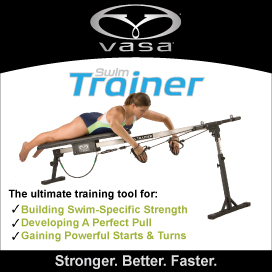 We have tested thousands of competitive swimmers, including Olympians from a dozen countries, and have found that every swimmer can make technique changes to swim faster. For this reason, Dr. Havriluk developed MONA (Modél Optimál NAtación) – a biomechanical model that presents only the positive elements of technique without any limiting factors. (Dr. Havriluk is a biomechanist and the president of STR.) The example below is one position within the butterfly stroke cycle. MONA is based on the principles of physics, published research on the biomechanics of swimming, and over 20 years of documented findings from Aquanex. MONA is the optimal model of technique because she has all the best features with none of the limitations. The MONA software package includes front, side, top, and bottom views of a biomechanical model of optimal swimming technique for all four strokes – butterfly, backstroke, breaststroke, and freestyle. The multimedia control allows you to step through the video images frame by frame or play at normal swimming speed. At each position within the stroke cycle there are cues to speed up the learning process. The cues give the swimmer specific information (exactly what to see and feel) for positioning and moving the head, arms, and legs. There is also information to identify the arm and leg phases, as well as notes about key factors. Dr. Havriluk uses MONA for his presentations. He is frequently asked how individuals can get their own copy. MONA is now available at the STR STORE online.